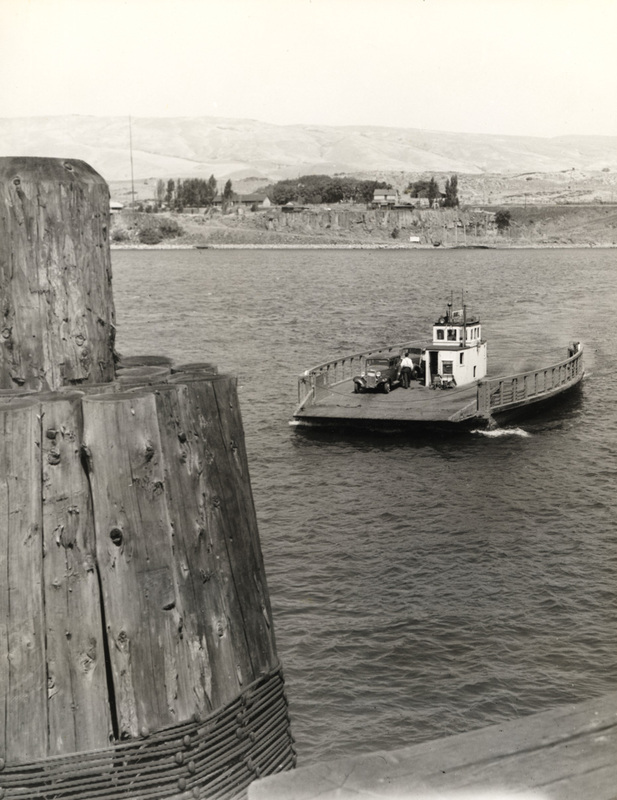 In 1940 you needed to take this ferry to get from the Dalles to Dallesport. We saw a 1941 view of this ferry a few months ago, but this one is even better. Yes, that is the old ferry that went from The Dalles to Dallesport, which was originally known as Rockland, and one can see why. I know there was a ferry there as early as 1873, as that is where my great-grant grandparents crossed the Columbia and went up over the hills on what was known as the old wagon road to the newly being platted Goldendale. How much earlier it had been there I don't know. There are some of the old pilings for the ferry landing that are still there on the river at The Dalles near where the old Umatilla House once stood. This is interesting as the ferry is around the "tug" portion. The one just east of Biggs before you got to Rufus, when I was a child, was the ferry, plus the tug at the side to propel it. The north side ramp roads shown here are still evident. The ferry Charlott mentioned went from Grant to Maryhill and was tug propelled compared to this self propelled boat. Seems the former may be more logical at repair time with the power unit separate from the ferry. Yes that ferry went from near where Grant was that was swept away in the 1894 flood. However, prior to that the ferry went from Biggs to Columbus, now Maryhill as my great-grandfather for a period of time owned it. His tug was named "Nellie." there was a time when two ferries actually ran across there, as Sam Hill had his own ferry. You can still see on the Maryhill side some of the debris from that ferry landing, but you have to know where to go. Had some experience in my youth with the tug boat industry as logging in Alaska was in remote areas. A ferry of this design is basically just a self-propelled barge. It needs a power source to lift and lower ramps even if a seperate tug is used for propulsion. The initial cost would be less with just one unit, and I would guess the difference in repairs and maintenance would be negligible. Maneuverability would be easier with just one unit. In Columbia river would probably only need one screw. Thus ferries you see today are one unit. Thanks Charlott for your "I remember" accounts. They add so much to this site. Most of us have to look through old newspaper accounts to find information. I am not able to find proof of it right now, but I think the ferry owner's home is still visible on the bank at Dallesport. A large, older white house. From this history link and a thank you to Jeffrey Elmer for making this information available. "The Dalles ferry was established by James H. Herman in 1859 and it was said that his first passenger was John Golden who founded Goldendale. It is interesting to note that that first ferry was a sail and oar operated ferry. Oh windy days the sail would propel the ferry- across the river, it being steered, by oars. On still days oarsmen had to row the ferry across the river. The captain or owner operated the steering oar, his deckhand operated the other rear oar. The passengers were required to operate the 2 forward oars and "work their way across the river." Those first ferries could haul 2 wagons and their teams. Alonzo Curtiss was one of the early owners of the ferry. Traffic was not very heavy in those days and the ferry was operated only once or twice a day. Foot passengers used a row or sail boat, as did saddle horsemen, who left their mounts at Rockland. " As Buzz says, they were basically a self propelled barge. I spent time on a smaller version of this one. It was used on the lower Columbia to ferry back and forth between the island farms and mainland. The ramp was raised with a hand crank. If the dog wasn't set firmly on the teeth, the ramp could drop down, while the ratchet handle flew around and hit whomever was in the way. The motor was accessed through a hatch in the cabin. I didn't like going down into that hole. It was blue with diesel fumes, noisy and very mechanical. The old guy that ran the barge was pretty darn good at landing it up against the dock and pilings, but sometimes he still hit it hard, so you had to be careful about standing on the edge. You might go for an unplanned swim. Sorry for taking up more space here, but this bit from Columbia River Images applies to today's ferry photo. ...The December 2, 1921 Klickitat County Agriculturist of Goldendale reported that Klickitat County had nearly 100 miles of river front on the Columbia river, and 6 ferries were operating within the County. The ferries were White Salmon (to Hood River), Lyle (to Rowena), Grand Dalles (to The Dalles), Maryhill (to Biggs), Roosevelt (to Arlington), and Alderdale (to Boulder). The May 20, 1932 Klickitat County Agriculturist reported a new ferry boat called Columbia began operating with 24-hour service between The Dalles and Grand Dalles. Columbia was 53 feet long and 16 feet wide, and was "large enough to carry anything which travels the highways, including trucks with trailers." The ferry could carry nine cars at a time and was powered by a Fairbanks-Morse diesel engine. The former ferry was to be repaired and used as a backup. The January 15, 1931 Goldendale Sentinel, in a report on the proposed The Dalles Bridge, stated that the The Dalles to Grand Dalles ferry had an income of $17,250 per year, the Maryhill to Biggs ferry made $25,700 per year, the Roosevelt to Arlington ferry made $30,000 per year and the Lyle to Rowena ferry made "about $9,000 per year".